In 2009, he came to Belize as an international celebrity, and left Belize as our Ultimate Chess Player- a true role model for children and adults. Since then he has been back to Belize 6 times, volunteering his time and skills to training, camps various BNYCF events. And once again we had a privilege to have Grand Master Ashley at the great event "Building Smarter Safer Society one move at a time", on November 17, 2011. 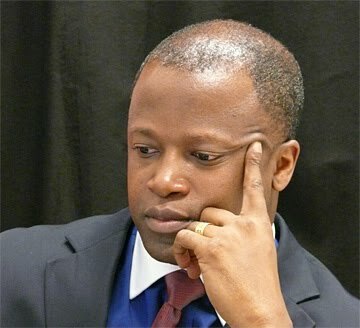 As part of his Caribbean Chess Tour Grand Master Maurice Ashley visited Martinique, Guadeloupe, US Virgin Islands, British Virgin Islands, Bahamas, Jamaica and arrived to Belize on November 17th, 2011. The morning started with the award ceremony for Junior Coaches, who received certificates and medals from the Grand Master: Maricela Cocom, Erwin Wills, Carlos Cocom, Zack Anderson, Axel Garcia, Kevin Guerra, Kris Sanchez, Javier Lisbey, Ivor Pixabaj, Rick Pascasio, Dwayne Rodriguez, Machiver Choc, Hilberto Choc. Three junior coaches were awarded additional certificates for continues dedication to developing chess in their communities: Colleen Tate, Fitzroy Chan and Alfred Awe. Two Junior Coaches advanced to the level of BNYCF adult coaching certificate after passing written and oral part of examination and received BNYCF coaches certificates and awards: Akeem Jenkins and Steve Flowers. Santos Carbahal, received an award for continuous dedication of developing chess in his district. After that GM Ashley faced 28 players that represented all the districts of Belize in the Simultaneous exhibition. Congratulations to the following participants: Toledo-Amir Coc, Juan Coy, Machiver Choc and Hilberto Choc; Orange Walk: Ryan Chi, Dennis Novelo, Gabriel Campos; Stann Creek- Alfred Awe, Javier Lisbey, Ivor Pixabaj, Kris Sanchez and Rick Pascasio; East Cayo - Lorenzo Cho, Carlos Cocom, Maricela Cocom, Akeem Jenkins; West Cayo - Vincent Hulse, Kevin Guerra, Simon Lotiff, David Coombs; Belize - David Martinez, Charlton Roches, Dwayne Rodriguez, Joshua Gegg and Steve Flowers: Corozal -Heisen Loria, Gerardo Gonzales, Michelle Briceno, Zyrian Quarez and Senior Group representative: Nellie Quigley. GM Ashley shakes hands with the oldest participant of the event, 85 years old member of the Belmopan Chess Group, Nellie Quigley. Next to her, there was the youngest chess player of the event, 7 year old player from Corozal. Among the players was the current National Champion Charlton Roches, next to him, one of the strongest adult players David Martinez, and behind them you can see the support group from the Golden Kings and Queens chess group. Our top boards- our highest rated players: Alfred Awe, Stann Creek, Akeem Jenkins, Cayo, Steve Flowers, Belize District. Since the event was taking place during the week, Chanel 7 and Love FM made sure that they have a very comprehensive coverage of the event. Thanks to them everybody else in the country had a chance to hear the inspirational words from the Grand Master and see our players interacting with him. THANK YOU! For the last 2 years GM Ashley has been back to Belize for 6 times, each time working with our players, helping them to improve their games and also inspiring them to strive for success. In addition to that, we had International Women Chess Master Sonia Zepeda from El Salvador, who worked with players from all the districts for half a year. So, we were happy to see the results of coaching - our players improved significantly and even though the Grand Master won 27 games, all the players put a good fight. AND, we even had one draw: Alfred Awe from Stann Creek proved one more time that he is our highest rated player in Belize. In the afternoon, Grand Master Ashley played blitz games against 15 participants with 2 mins on the clock for them and 1 min on the clock for the Grand Master. Congratulations to the Blitz participants: Leander Campos and Ayleen Perez from Orange Walk; Joshua Gegg, Dwayne Rodriguez and Mauricio Noble from Belize, Hilberto and Machiver Choc from Toledo, Orvin Carillo and Keiderre Loria from Corozal, Christian Velasquez and Kareem Jenkins from East Cayo, Vincent and Anthony Hulse and from West Cayo. Brent Toombs from Oxa Production, who always volunteers his time to all BNYCF big events, was recording the whole event, and is putting together one hour show summarizing the main highlights. Thank you! GM Ashley also presented BNYCF with the special package of Chess software, that was donated by Chess Base. We have a very limited amount of chess books and software, so this donation will make a great impact. Grand Master Ashley told all the participants that he is very proud of their improvement in chess and that he is looking forward to see them on his next trip to Belize! Special Thanks to Art Box for the great awards that they produced and donated to all 42 participants, Radisson Hotel, BTL and Caves Branch Jungle Lodge for sponsoring the event.